For the life of me, I cannot imagine fox hunts in Brisbane. Sure, I understand that farmers would have shot foxes to protect their livestock; but a proper, port drinking, red coat wearing, horse and hounds type fox hunt? Surely not! It happened, though, and I have proof. Below is a photo from some time around 1892, showing a group about to set off on such an adventure. Britain was the bastion of the fox hunt, (although it has probably seen its last days there anyway); and foxes were imported from there into Australia for sporting purposes. Yes, I agree that, from the viewpoint of these enlightened and PC times, hunting a wild animal using a pack of dogs to chase it down and tear it to pieces is cruel and abhorrent; but back in those days, I'm sure that they saw it as having a dual theme - ridding the area of a pest, and a group activity of conviviality and action. If you are interested, this link takes you to the digital record at the library where you can read for yourself the names of the riders and their horses! It appears the dogs weren't thought of as highly, as they do not rate a mention. 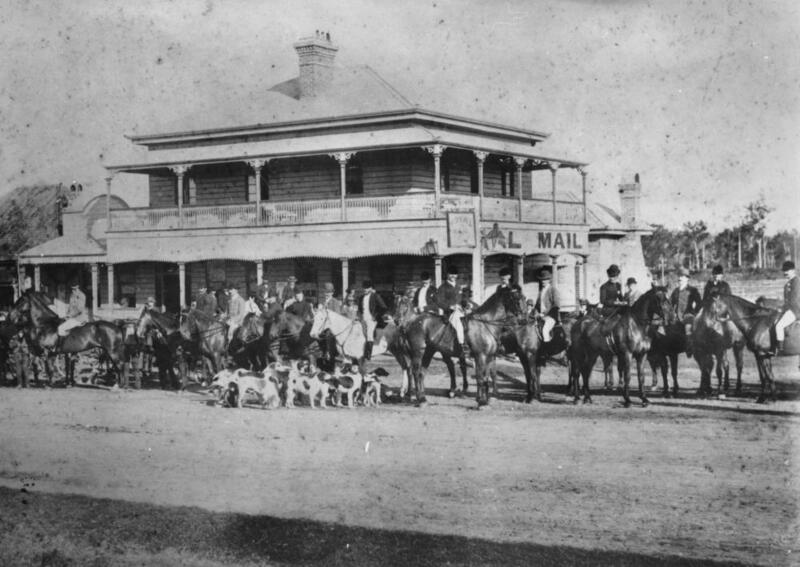 The photograph was taken outside the Royal Mail Hotel at Goodna, which had been a stopping point for the coach journey between Brisbane and Ipswich. By the time the photo was taken, however, the rail line was complete and travel by coach had pretty much faded into memory. Further information about Goodna's past can be read here in a document called "Goodna Then & Now", although I have no knowledge of the document's authorship or sources. It is just out there in "The Cloud"! In any case, there is still a Royal Mail Hotel at Goodna, and you can see it in my recent photo above. Whether it is the same building or even on the same site, I am afraid I cannot say: it certainly looks similar to the building in the older picture, and the name "Royal Mail" is partly hidden behind a tree - click the photo to see a larger image. Goodna is now much larger and more suburban than rural, and if there are any foxes left there, they can rest easier knowing that they will not be descended upon by baying hounds and galloping horses. Yoicks!